bwo eats: Pies + Things. Holiday time… A time to gather with family, and a time to give thanks… A time for sharing, and caring, and let’s be real, for eating and eating and eating. And even though my parents have been on the most stringent diet I have ever heard of (g-d bless them, because they are rocking it! ), I thought I’d use my time at home to lavish them with my cooking skillz, while taking advantage of their non-NYC-sized kitchen. So, being that I was still just so smitten about my super successful pie dough from Smitten Kitchen, I felt I was ready to give them a real reason to blow off that diet for a day. I would make them the best Pecan Pie ever - or so, that was the plan. In any case, I went back to Ms. Stewart’s version, and continued on. All in all, this was a completely simple recipe, in terms of preparation. Where the real science comes into play, is deciding when it’s done. Pie complete, I needed to figure out what to do with my remaining disk of pie dough. Remembering the recent interview with Aly Fox, I visited goodeggs.com, and went over to their blog hoping for some inspiration. Well, boy did I find it. I would make a Caramelized Onion Galette. Luckily my family buys life in bulk year round, so onions were plentiful. I even learned a new trick while fighting through the tears of slicing. If you remove the skins and place halved onions into an ice water bath, it cuts down on the fumes that make us cry! (Was I ever thankful for that) 6 onions and still a few tears later, I tossed my thinly sliced onions with the half stick of butter I had heating up. I did not have fresh thyme, so I added a generous amount of its dried equivalent instead. Immediately fragrant, I knew this was going to be good. After about 30 minutes, my onions were a beautiful caramel color and set aside to cool. Assembly is pretty straightforward after that, with a bit of freedom for creativity in crust folding. 50 minutes in the oven, and voila! I had made this the night before and reheated for about 15 minutes at 375 degrees. A hit of an appetizer, if I do say so myself. With dinner over, and family drunk on food and wine, I was ready for dessert. Unveiling my masterpiece, knife in hand, I dove in… to find goo. The middle oozing out, I continued to cut with despair. Bless the hearts of my crazy family, they all assured me it was delicious. But I was skeptical. I will say that it did TASTE just fine, flavor-wise, but texture and consistency were off. Whelp. You win some, you lose some. I’ll take this as a loss, but with a new fire sparked and a resolve to try again at Christmas. Preheat the oven to 375°F. Heat butter in heavy-bottomed pot, add onions and thyme sprigs, then sauté over medium heat until onions are caramelized, about 20 to 30 minutes. Salt to taste. Remove from heat and let cool. 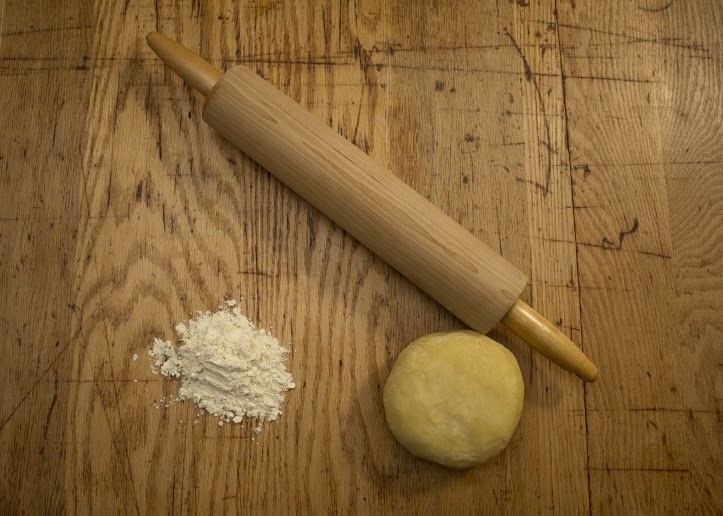 Meanwhile, on a well-floured surface, roll out chilled pie dough into a 12 to 14-inch circle (about ⅛ inch thick). Don’t worry if your shape is more blobby than circular––any irregularities just add to the homemade charm! Transfer rolled-out dough to a baking sheet lined with parchment paper and let it firm up in the fridge for about 10 minutes. Spread the cooled onions over the center, picking out the thyme sprigs. Leave a good inch or two around the edge so you have ample dough to fold up around the onions. Fold up the edges, making sure there are no holes. Willy-nilly works or you can use a pinch and fold method like we did here. Once your tart is all wrapped up, coat the folded edges with beaten egg using a pastry brush––or your fingers! Bake at 375 °F for 40 to 50 minutes––or until the crust is golden brown on the bottom. Let cool slightly, garnish with a pinch of fresh thyme and serve warm.